A Quebec coroner is urging the province to make all residential pool owners install locks on their pools, following an investigation into the drowning of a young boy. Two-year-old Brendon Bellefleur Isabelle died on July 12, 2012 in Sainte-Anne-des-Plaines, Que. Modify residential pool safety regulations so that the standards apply to all pools in the Quebec territory, regardless of their installation date. 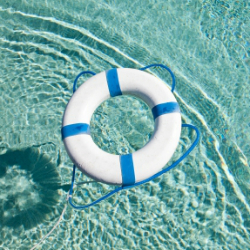 Allow a two year delay for people who owned pools installed before July 22, 2010 to confirm to security standards. The recommendations from the Quebec coroner are not binding. A 1.2-metre-high enclosure with no openings big enough to allow the passage of anything 10 centimetres wide or larger. A hedge or a shrub does not constitute an enclosure. The enclosure must have a door that shuts and locks automatically. Any pool equipment, such as pumps, which could allow someone to climb over the enclosure, must be located at least 1.2 metres away from the pool or the enclosure. Above-ground pools with a wall that's at least 1.2 metres high do not need an enclosure if the pool is only accessible by a ladder closed off by a locked door. In-ground and semi-in-ground pools must be equipped with a ladder or stairs. Radio-Canada reported that Brendon’s mother, who is still shaken by his death, is not willing to speak with media. The two-year-old drowned in the family pool after he slipped out of the sight of adults. On the same day as Brendon’s death, a two-year-old girl drowned in Saint-Rémi, in the Montérégie. According to Radio-Canada, both tragedies could have been avoided if the enclosures surrounding the pools had been equipped with a door that shuts automatically. But those doors are not mandatory for pools installed before 2010. Raynald Hawkins, the general director of the Quebec Lifesaving Society, hopes that Quebec government will be quick to endorse the coroner’s recommendations. “The death of this little two-year-old boy could have been avoided, just like the six other children under five years old who died in the summer of 2012 in residential pools,” he said. According to Hawkins, there were 50 drownings in the province last year, the lowest in the past 20 years.